Good credit (670-739) opens the door to some fantastic credit card offers. Whether you're looking for cash back or low rates, compare the best offers from our partners and find the right card for you. 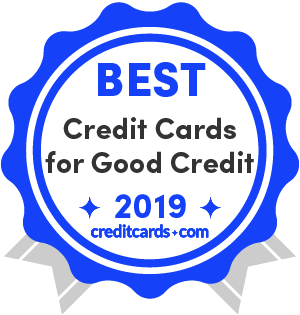 For even more options be sure to check out our top credit cards of 2019. See the best credit card offers for people with good credit from our partners below. Earn 4X Membership Rewards® points at U.S. restaurants. Earn 4X Membership Rewards® points at U.S. supermarkets (on up to $25,000 per year in purchases, then 1X). Good credit is your reward for all those months of on-time payments and other terrific credit habits. However, one or two wrong steps can cause your score to drop quickly. That's why it's important to understand the nuances of credit and how good credit can reward all that hard work. What should I look for in a credit card if I have good credit? How many people have good credit? Learn more about how to build credit and the benefits of good credit. No fuss, no hassle, no annual fee – that's what you get with the Chase Freedom Unlimited. Offering a spectacular 3% cash back on up to $20,000 in purchaeses in the first year, and a constant 1.5% cash back on all subsequent purchases, the CFU is ideal for those who want to forego the bother of keeping track of rotating categories. Cardholders will also enjoy the flexibility in redemption from Chase's Ultimate Rewards portal. Bottom Line: The Chase Freedom Unlimited card is a great for easy cash back with no annual fee. As a credit card with rotating rewards categories that earn 5% cash back, the Discover it Cash Back is perfect for people who find themselves buying a diverse assortment of goods and services throughout the year. Its most distinguishing feature is the cashback match offer – at the end of your first year, Discover will match all the cash back earnings you accumulated. It also works well as a low interest credit card, although it's always best not to carry a balance on your credit cards. Bottom Line: The Discover it's low APRs and cashback match feature make up for its lack of a sign-up bonus. Another fairly straightforward credit card offer, the Capital One Quicksilver provides easy to understand benefits. Its largest value propositions are 1.5% cash back on all purchases, a $150 sign-up bonus that's easy to hit, and no annual fee. You'll also never have to worry about foreign transaction fees, making it a solid card to take on trips abroad. Bottom Line: Straightforward and sweet with flat-rate cash back and a nice sign-up bonus. The HSBC Cash Rewards Mastercard starts with an intro 3% cash back on all purchases in the first 12 months, on up to $10,000 in purchases, then 1.5% back on all purchases. Here's a fun little feature – a 10% anniversary bonus on all cash back rewards earned each year. Additionally, there is no annual fee. Bottom Line: Not all cash rewards cards come with no foreign transaction fees, but with this card you can save on foreign travel and spending. The Blue Cash Everyday shines the brightest when it is used as a daily driver – that is on ordinary purchases like gas and groceries. We say this because of its fantastic 3% cash back at U.S. supermarkets, 2% cash back at U.S. gas stations and select U.S. department stores, and 1% cash back everywhere else. All that cash back, plus a respectable $150 welcome bonus for spending $1,000 in your first 3 months, is available at an annual fee of $0. Bottom Line: The BCE is arguably the strongest no-annual-fee option for your "mundane" purchases. This spanking new card doesn't just earn you sign-up points and ongoing rewards, which are good in themselves. You'll also earn 10% back on up to 100,000 points in redemptions and your rewards will be rounded up to the nearest 10 points with every purchase. Add to that, earn 15,000 points after a $1,000 spend within the first 3 months of card membership and 2X points at supermarkets and gas stations up to a $6,000 spend each year (then 1X). Bottom line: If you want to earn points after every turn, this card is just full of redemption fun. This card is very popular with people who have used a few credit cards and want to try a "next level" card. It offers a strong sign-up bonus of 60,000 Chase Ultimate Rewards points for spending $4,000 in your first 3 months. That's a lot of immediate value considering the relatively low annual fee of $95. Points can also be redeemed for 1.25X value through Chase's travel portal, and you can continue adding to your stash with 2X points per dollar on travel and dining purchases. Bottom Line: The CSP is a great all-around card with a big sign-up bonus. The Propel offers some of the most compelling rewards value, despite not even charging an annual fee. It offers 3X points across a wide swath of categories that include gas, flights, hotels, rideshares, and other travel purchases, as well as dining. The sign-up bonus is also sizeable at 30,000 points and is awarded for spending $3,000 in the first 3 months. Bottom Line: This is the cream of the crop for high rewards among cards with no annual fee. Not only can you earn 50,000 miles after spending $3,000 within your first 3 months of card membership and earn 2X miles on all purchases, this card offers a $100 credit on Global Entry or TSA PreCheck, no foreign transaction fees and you can transfer your miles to more than 12 travel partners. Bottom line: Perfect for the road warrior, now through January 2020 you can earn 10X miles on hotel purchases made through hotels.com/venture. That's by far the best deal for hotel spending out there right now among our cards. This is the card other products chase – $150 sign-up bonus after a $500 spend within the first 3 months and 5% back on rotating categories for up to $1,500 a quarter. Add to that, there's a 0% intro APR for 15 months on purchases and balance transfers (after that it's a variable 17.24%-25.99%). Bottom line: Even with a foreign transaction fee, this no-annual-fee card is hard to match, with its sign-up bonus, ongoing rewards and partnership with Chase Ultimate Rewards cards, such as the Sapphire products. What qualifies as good credit? A "good credit" FICO score is 670-739 out of a range of 300-850, with 850 as the best. With the same scale, a good VantageScore is 700-749. With good credit, you can enjoy not only better lending products but lower insurance rates, improved rental options and even better job opportunities. With bad credit, higher interest rates, loan rejections and credit cards with inferior rewards can come your way. Pay attention to your good credit, because within a month, your score can take a hit because of one misstep. In fact, it can take considerably less time to drop your score than to improve it. By paying on time and in full each month, you are addressing 65% of your FICO score. Here are the score ranges for FICO, the dominant scoring model, and VantageScore, which you can access for free on creditcards.com. There are a surprising number of ways that a bad score can affect your world. From buying a house to renting an apartment, your options can open up or be limited depending on your score. Millennials are particularly vulnerable. When polled, 46% expressed concern that their score is holding them back, according to OppLoans research, a financial technology company. Cards for good credit often offer excellent rewards, can have superior balance transfer options and are great for building credit. Although cards for excellent credit offer more options, a variety of cards are available for good credit. Here are 4 types of cards, with cards for good credit and no annual fee. While cards for good credit may be slightly more limited in choice than those for excellent credit, there are still some great options, as you can see. Good credit simply means that your score, generated by a scoring model, such as VantageScore or FICO, is high enough that you can benefit from better financial products. The scoring models look at several factors in an effort to ascertain whether you are a good credit risk. The higher your score, the less risk you are for the lender. Paying on time. The most important aspect of your credit score is on-time payments. It makes up 35% of your FICO score, the score most used by lenders to assess your creditworthiness. One late payment can drop your score to the next range, although the older that late payment gets, the less impact it has. This category is also the most important factor for VantageScore, the scoring model developed by the 3 major credit bureaus: Experian, Equifax and TransUnion. Paying in full. This category makes up 30% of your FICO score. It looks at the amount of credit you have available compared to the amount you owe. That's called your utilization ratio. For example, if you owe $100 and you have $1,000 in available credit, your utilization ratio is 10% -- you want the percentage as close to zero as possible. The amount of credit used is considered highly influential in the VantageScore model. Credit history. How old are your accounts in your credit file with the 3 credit bureaus? This makes up 15% of your FICO credit score and it's highly influential with VantageScore. Recent credit. Avoid applying for multiple credit cards at once, because that can negatively impact your score, although a single pull typically only impacts your score by about 5 points. Recent credit makes up 10% of your FICO score and falls under "less influential" on VantageScore. Note that rate shopping for installment loans within a short amount of time, which can range from 15-45 days, typically only counts as one credit check, because credit score models recognize that rate shopping is a good credit habit. Credit mix. FICO likes it when you have different types of credit, such as revolving credit (cards) and installment credit (car loans and mortgages). It makes up 10% of your FICO score and is highly influential in VantageScore. Available credit. VantageScore also has a category called "available credit" that is considered less influential. There is also a category called "total balances/debt" that falls under moderately influential. Installment loans. The best known of credit score uses, your credit can impact not only your interest rate but even whether you can get a loan. Credit scores are used by lenders of mortgages, car loans, private student loans and other lending products. Credit cards. The credit cards with the richest offers typically require good or excellent credit. For example, you can get a rewarding cashback card with no annual fee if your credit is good or excellent. Apartments. Increasingly, landlords are looking at potential renters' credit before making a call on accepting a lease application. If you have good credit, you are that much more likely to be accepted. Insurance premiums. An InsuranceQuotes.com study in 2016 shows that if you have poor credit, your home insurance premiums more than double when compared to excellent credit. So, your auto insurance premium can be affected by your credit. Cellphone. Your cellphone provider may run a background check to ensure you can meet your obligations. Employment. Employers are increasingly running background credit checks prior to offering a job. Employers access a different report from that of lenders, and they don't have access to your score. Also, they have to have your approval to pull a report. Dating prospects. When asked if a credit score could make you think twice about dating someone, 35% of men and 50% of women said yes, according to a Bankrate poll commissioned in May 2017. Having good credit unlocks a whole new word of options when it comes to the credit cards you can get. "Consumers with good credit are in an excellent position to earn lucrative credit card sign-up bonuses and rewards for ongoing spending. Many of the best cash back cards are targeted at people with good credit," points out Ted Rossman, CreditCards.com industry analyst. Types of cards. With good credit, your options open up tremendously. You can earn 2%, 3%, even 5% back with a cashback card, or earn points or miles in the 10s of thousands in a travel card's sign-up bonus. Sign-up bonus. Compare the sign-up bonuses for the cards you are looking at. But be sure to compare apples with apples. For example, is there an annual fee? And what is the actual valuation of the points or miles? As Rossman advises: "When comparing options, think about how you spend most of your money and how you want to redeem your rewards. Look to maximize key categories like groceries, travel and dining out." Benefits. Cards that require good or excellent credit often offer benefits such as rental car insurance, free luggage and even annual airline credits. Interest rates. If your priority for your next credit card is a low interest rate, your good credit will help with that. There are a few low-interest cards out there and a number of 0% intro APR offers. But what do those scores mean for you? Here, we look at the percentage of people with each scoring range and what that score means for them. 300-579 Poor 17% Credit applicants may be required to pay a fee or deposit, and applicants with this rating may not be approved for credit at all. 580-669 Fair 20.2% Applicants with scores in this range are considered to be subprime borrowers. A surprising number of Americans misunderstand what it takes to build a good credit score. In one Bankrate poll, consumers were asked some key questions about their beliefs regarding credit building, and many didn't realize that high card balances can negatively impact your score; you want as close to 0% as possible in your debt-to-balance ratio; and you want to keep the account active with a charge that you pay off each month. Building good credit takes patience and determination, but even the thinnest of files can be improved within a few months. Check your credit score. You'll need this for the next step. Apply for a credit card. Only apply for one, and make sure it's one that you have a good chance of getting. You may need to get a secured card, which means you pay a refundable deposit in exchange for a credit limit. Make sure the card issuer will share your credit habits with the credit bureaus. Pay in full and on time. This is 65% of your FICO score. Become an authorized user. If your credit is too poor for landing a card or you don't trust yourself with one, look into being an authorized user with a cardholder who is responsible with credit. You won't have to use the card to build credit, and you won't be responsible for the debt. Eventually, you'll want to get your own card, though, so that you can withdraw from being an authorized user without losing credit ground. Keep in mind that when you withdraw, the authorized card's good habits are withdrawn from your credit accounts. That's why you'll want to get your own card at some point. Take out a credit-builder loan. To give your score that extra little boost, take out an installment loan, such as a car loan or a credit-builder loan. Don't take out more than you can afford. Make a small payment. Even if you don't use a card much, make a small payment each month to keep the account active. Don't close accounts. There are a few exceptions to this, but typically it's a good idea to keep accounts open and active because available credit with a low balance helps your score, and when you close an account, your aggregate available credit goes down. Keep a budget. Allowing for saving and fun, maintain a workable budget to ensure you don't overspend on your credit card. It typically takes at least 6 months of credit activity before a credit score can be calculated, according to credit scoring expert Barry Paperno. You need at least one credit account to have a credit file. When you don't have much credit to speak of, that's called having a thin file. With good habits (pay on time and in full each month), you can build your credit score within months. Rebuilding? It can take anywhere from a few months to years, depending on what's on your credit file. Large debts, collections, bankruptcies – all of those weigh more heavily than one or two late payments. Check your credit files. Look for collections, unpaid bills and other issues that can be cleared up. Contact the credit bureaus to correct any inaccuracies. Quickly resolve any problems with creditors, and get in writing that they will contact the credit bureaus with the resolution. Catch up. Your payment history is your most important aspect of your credit, so it's critical to catch up with any payments and stay on top of them. Reduce your card balances. The second most important aspect of your credit score is the debt-to-balance ratio, called your utilization ratio. That's why it's so important to keep your balances low. The difference between good and excellent credit can be the difference between good and great rewards, nice and amazing balance transfer offers, and pretty great and outstanding benefits. You can also get better interest rates, lower insurance rates and other financial advantages. Once your score hits about 750, know that things start to slow down in terms of score improvement. But there are a few tricks to help your score achieve its best. Here, we look at a few quick tips for maximizing your score and landing an 800 or better. Pay on time. If you have good credit, you are likely already paying in full and on time. Keep it up! Don't close your old cards. This allows you to continue to have high available credit and to keep building your long-term credit. Put a small charge on them each month, paying them off each month. Take out an installment loan. Installment loans include mortgages, car loans and some credit-builder loans. While you don't want to incur unnecessary debt, a small installment loan can give your credit score a little nudge. Avoid taking out multiple cards at once. Stay steady and don't apply for multiple credit cards at once. While a small part of your credit score, applications can drop it to the next tier in a worst-case scenario. One card application can affect your score by about 5 points, whether you are accepted or not. Plan taking out credit. If you know you want to, say, apply for a mortgage soon, keep things low key for several months by not suddenly taking out a card or incurring new debt. Lenders can see sudden changes in your financial habits as a warning sign that you are desperate. Be patient. One element of credit building is time spent building that credit. That's a big reason why a cardholder with great credit habits might have a lower score than a consumer with great credit habits and more years as a card user. Ask for lower rates, higher credit limits. A CreditCards.com poll found that of those who asked, 85% of consumers who asked got an improved credit limit. Of those asking for a lower interest rate, 56% received one. So, it's worth a try. Upgrade to better credit cards. With excellent credit, you can get improved benefits and richer rewards. Do a loan and insurance premium checkup. Have your loan officer and insurance agent run the numbers again, because chances are, you qualify for a better rate.